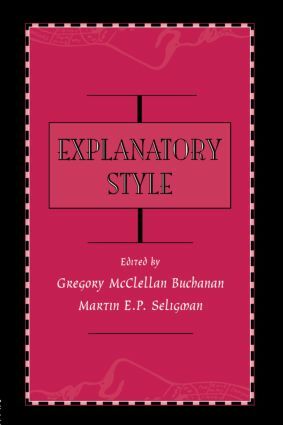 This is the first work to condense the large literature on explanatory style -- one's tendency to offer similar sorts of explanations for different events. This cognitive variable has been related to psychopathology, physical health, achievement and success. Compiled by experts in the fields of depression, anxiety, psychoneuroimmunology and motivation, this volume details our current level of understanding, outlines gaps in our knowledge, and discusses the future directions of the field. Data from a vast number of studies are presented, including results from studies not previously reported. Coverage includes sections on cross-cultural comparisons, life-span and development issues, and gender differences; and an extensive description of the measurement of explanatory style offering questionnaire and content-analysis methods for children, college populations and adults. This work is thus a valuable tool for anyone involved in research on the etiology and treatment of depression, cognitive therapy, motivation and emotion, and the link between physical and psychological well-being. Contents: C. Peterson, G.M. Buchanan, M.E.P. Seligman, Explanatory Style: History and Evolution of the Field. K. Reivich, The Measurement of Explanatory Style. J.P. Eisner, The Origins of Explanatory Style: Trust as a Determinant of Optimism and Pessimism. S. Nolen-Hoeksema, J.S. Girgus, Explanatory Style and Achievement, Depression, and Gender Differences in Childhood and Early Adolescence. C.J. Robins, A.M. Hayes, The Role of Causal Attributions in the Prediction of Depression. R.J. DeRubeis, S.D. Hollon, Explanatory Style in the Treatment of Depression. L.Y. Abramson, L.B. Alloy, G.I. Metalsky, Hopelessness Depression. S. Mineka, C.L. Pury, A.G. Luten, Explanatory Style in Anxiety and Depression. P. Schulman, Explanatory Style and Achievement in School and Work. D. Rettew, K. Reivich, Sports and Explanatory Style. H.M. Zullow, Pessimistic Rumination in American Politics and Society. G. Oettingen, Explanatory Style in the Context of Culture. G.M. Buchanan, Explanatory Style and Coronary Heart Disease. C. Peterson, Explanatory Style and Health. G.M. Buchanan, M.E.P. Seligman, Afterword: The Future of the Field.